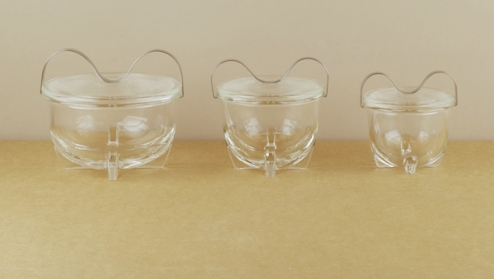 Created by the German industrial designer Wilhelm Wagenfeld in 1933, the lids of these two piece glass containers are held firmly in place by the sprung clip that also doubles as a handle. Typically an egg or eggs are broken into lightly buttered coddlers, flavoured, sealed, and covered to halfway in a pan of nearly boiling water, a bain-marie, or placed in a warm oven. The coddlers are also good for preparing deserts, pâtés, storage, or even steaming suet puddings. Available in four sizes, the smallest being approximate to the size of a small egg.